Enniscorthy Rock ‘n’ Roll Town Festival and Enniscorthy Food Festival have joined forces to bring create the unique experience of a Rockin’ Food Festival and welcome thousands of visitors this August bank holiday in Ennicorthy, Wexford. Food and music lovers will enjoy a plethora of fabulous entertainment including Rock ‘n’ Roll along with the best of Irish food, craft and design from July 29th to 31st July 2016. 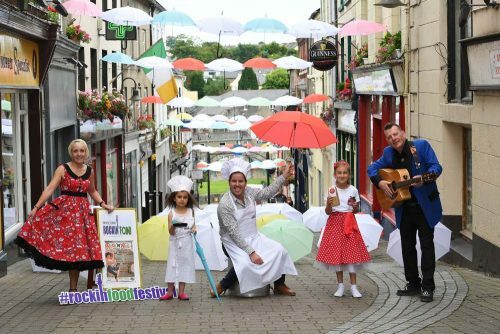 Enniscorthy Rock ‘n’ Roll Town Festival is based on 1950s Rock ‘n’ Roll, Rockabilly and Rhythm ‘n’ Blues music and attracts visitors to the town from all over Ireland and across Europe. There is fun for all the family in the square with children’s carousel, face painting, balloon makers and an outdoor screened movie. Jessica Reilly , The Mad Hatter , Leilah Lopes , Oisin Lambert from Enniscorthy and Alice in Wonderland with Celebrity Chef Edward Hayden – Photo Dominick Walsh. To keep enegry levels up punters can enjoy a tapas trail, celebrity Chef cookery demonstrations and tastings with Chef Edward Hayden, a locally produced craft beer and cider exhibition along with a showcase of a variety of local produce and crafts from Wexford and beyond. Enniscorthy Rockin’ Food Festival offers an extensive FREE events programme with a choice of over 40 free events on offer, including live music gigs all weekend, Artisan Food, Craft and Beer Markets, Outdoor movie screenings, Junior 1798 Rebel March, Ancient East Story telling and lots more. Younger festival goer’s also have some touch choices with Junior Rebel Parade, Treasure Hunt, Mad Hatters Tea Party, Bungee Trampoline, Arts & Crafts, Storytelling & Punch & Judy Shows. 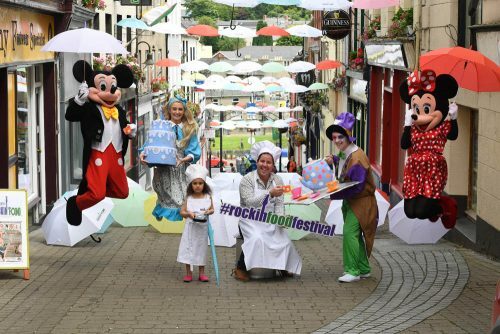 Pictured are Mickey Mouse , Alice from wonderland, Leilah Lopes from Enniscorthy , The Mad Hatter and Minnie Mouse with Celebrity Chef Edward Hayden – Photo Dominick Walsh. The 1950’s trend will be to the fore with Rock ‘n’ Roll, Rockabilly and Rhythm ‘n’ Blues music and dancing on offer and keeping to the 1950’s trend and being the hometown of one Colm Toibin outdoor screenings of the movie ‘Brooklyn’ will also take place. 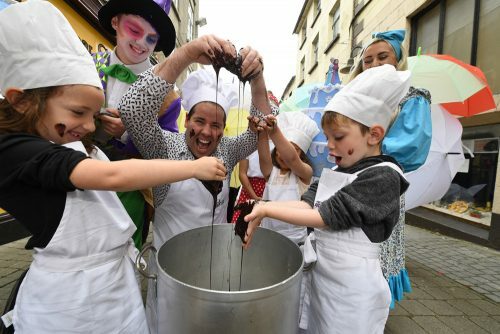 Enniscorthy Rockin’ Food Festival includes so many FREE events you will have to save the date for an action packed weekend full of flavourful fun this August Bank Holiday.